Rarely in modern history has a statesman’s words been so at odds with his actions as those of French President Francois Hollande in dealing with US spying on its allies. When Mr Edward Snowden, the former US National Security Agency (NSA) infrastructure analyst, revealed that the NSA had bugged the European Union’s offices and embassies of several EU member states, tapped into communications cables, and bugged the 2009 meeting of the G20 leaders in the UK, the French president thundered that this was “unacceptable behaviour” among friends and allies. Yet, on suspicion that Mr Snowden may have been on board the Bolivian President Evo Morales’ plane, Paris took the unprecedented step of refusing the plane permission to fly over its territory on Tuesday. Actions speak louder than words and while European leaders have feigned outrage about the US eavesdropping on the communications of its citizens and bugging of their embassies, they did not want the man who revealed the extent of US espionage to seek asylum in their countries. If Mr Snowden were on the Bolivian president’s plane and if he were to ask for asylum during a refuelling stop, it would have placed the government of a European state in an impossible situation. Since EU-wide laws prohibit the extradition of persons to countries with capital punishment, it would be politically suicidal for any government to deliver him to Washington. Yet, while European leaders were vociferous in denouncing US espionage, none were willing to defy the US on the issue. Hence, France, Portugal and Spain took the unprecedented step of revoking pre-arranged flight permissions for President Morales’ plane—an action in which they were subsequently joined by Italy. When the plane, running low on fuel, finally landed in Vienna’s Schwechat airport, President Morales was prevented from leaving for 13 hours while the Austrians satisfied themselves that Mr. Snowden was not on the plane. The special UN rapporteur for the freedom of expression in 2004, along with his counterparts in the Organization for Security and Cooperation in Europe and the Organization of American states, the Guardian newspaper reports, enjoined all governments to protect whistleblowers from all “legal, administrative or employment-related sanctions if they act in ‘good faith’”. By revealing the magnitude of US espionage against their citizens and governments, Mr Snowden clearly acted in public interest. Indeed, before Mr Snowden’s revelations, the Director of US National Intelligence, Mr James Clapper had testified to the US Senate Intelligence Committee that in March that the NSA did not collect data indiscriminately on millions of Americans—a testimony he was compelled to retract this week on the scarcely credible ground that he had “simply did not think” of the relevant provision in the Patriot Act that permitted the collection of such data. Likewise, President Barack Obama had claimed several times that the NSA was not eavesdropping on phone calls domestically without warrants—a claim that is proven wrong by Mr Snowden’s revelations. Let us also recall that these very same European governments—especially Spain and Portugal—allowed the use of their “airspace and airports for flights associated with CIA secret detention and extraordinary rendition [torture] operations” as the Open Society’s Globalizing Torture: CIA Secret Detention and Extraordinary Rendition investigation uncovered in a report published earlier this year. An ongoing investigation in France is examining whether the government permitted similar CIA flights. Victims can be carried over their airspace to be tortured but whistleblowers who reveal breaches of their citizens’ privacy and of their own sovereignty cannot! And this from member states of the EU that won the 2012 Nobel Peace Prize for the “advancement of peace and reconciliation, democracy and human rights in Europe”! Speaking out against US actions while surreptitiously aiding Washington is, of course, not a novel practice for its European allies. Ten years ago, the then French president Jacques Chirac loudly proclaimed that an assault against Saddam Hussein’s Iraq was unacceptable to Paris but when the US assault started Chirac opened French airspace to US military flights—something he had not done as premier for Reagan’s attack on Libya in 1986. Though Germany also opposed the Iraq war, once it had begun, its foreign minister prayed for the ‘rapid collapse’ of the resistance. Even Russian president Vladimir Putin for a decisive victory for the US ‘for economic and political reasons,’ just as he offered asylum to Mr Snowden on conditions that he knew would be unacceptable. The current generation of European leaders have not known a time in their lives when the United States did not dominate their countries—in the economic, political, and perhaps even cultural arenas. For them to symbolically challenge the US is one thing, to challenge it substantively is another thing altogether. Hence, even when their sovereignty was violated with the bugging of their diplomatic missions and EU offices, and when the privacy of their citizens was infringed by the tapping of their phones and digital communications, all they could do was to do all they could to see that Mr Snowden does not seek asylum in their countries even if that meant endangering the lives of President Morales and his entourage. Would they have done that if President Morales was of European descent? Though it should not have caused any surprise, the news that Eurozone economies had contracted by 0.2 percent in the second quarter of 2012 underscored the deepening economic crisis faced by the 17-state bloc. Though the German economy may have grown by 0.3 percent, France recorded a third straight quarter of no growth, and the Finnish, Italian, Portuguese, and Spanish economies all fell sharply. Greece, of course, suffered the steepest fall: 6.2 percent in the second quarter–and was 18 percent below its GDP level in the April-June quarter of 2008. There is little doubt that the declines have been aggravated by a failure of political imagination. Confronted by budget deficits brought about by high levels of government borrowing and by the collapses of housing bubbles, the creation of a common currency has meant that indebted Eurozone economies have not been able to resort to a currency devaluation to gain a competitive edge. Consequently, the troika of the European Commission, the European Central Bank, and the International Monetary Fund sought to impose an “internal devaluation” on these economies by forcing budget cuts to lower government deficits and wage cuts. It follows as the night the day that if budgets and wages are cut, the economy will shrink. Lower government spending due to budget cuts means welfare and pension benefits fall, the cost of health care rises, and educational opportunities vaporize. These impact far more adversely on the elderly and the young. With wage cuts, people have less money to spend and this will depress all sectors of the economy–as sales reduce because of lower spending, companies will slash their work forces leading to greater declines in sales and to further cuts in employment. In the most severely affected of the southern European economies, unemployment rates for the youth are already at 50 percent or more. By May 2012, unemployment in the euro zone had already reached 11.1 percent or 17.5 million people and the International Labor Organization (ILO) estimates that it would rise to almost 22 million in the next four years. And if the euro zone were to break up, the ILO estimates unemployment in the 17-state bloc could reach 17 percent. The adverse conditions created by the stringent cuts mandated by the troika are aggravated by the greater interest rates imposed on the weaker economies by international financial markets–thus for instance, while Austrian banks and other financial institutions can borrow at 2 percent, Italian banks have to pay 6 percent. As these higher interest costs are passed on by the banks to their borrowers, the cost of doing business in Italy, Spain, Portugal, or Greece increases correspondingly and could even negate the wage cuts imposed by the troika! The effects of economic contraction will spread to the better performing economies. After all, Germany has been able to have a strong industrial sector because cheaper credit to other eurozone members had allowed them to buy German products while the German small-scale sector–which employs 60 percent of the country’s labor force–did not have to worry about currency movements in other European countries or fear that a strong German mark will price them out of the market in other countries. 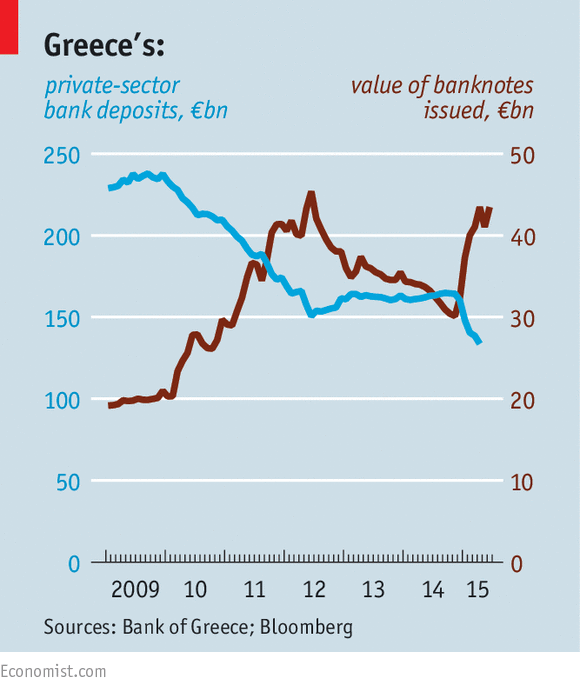 As Susan Watkins has written, German lessons on debt repayment are especially galling to the Greeks. Under the Nazi occupation, a hefty monthly payment was extracted from the Greek central bank to cover the Wehrmacht’s expenses; in March 1942 an additional forced loan of 476 million Reichsmarks was levied by the Axis powers. Greek partisans put up some of the toughest military resistance to the Nazis in Europe; the damage wreaked by the occupiers’ revenge was commensurate. Reprisals were exacted on the civilian population at a rate of fifty Greeks for every German killed. Much of the country’s infrastructure was destroyed; forced exports and economic collapse helped bring about one of the worst famines in modern European history. five thousand times more severe than the Weimar inflation of the early 1920s. Price levels in January 1946 were more than five trillion times those of May 1941. The exchange rate for the gold sovereign in the autumn of 1944, shortly after the liberation, stood at 170 trillion drachmas. After the war, the question of German reparations were deferred till German reunification and in the so-called 2+4 (Bonn and Berlin with the US, the USSR, the UK and France) agreement of 1990, Greek claims were excluded. Though several Greek politicians including the current prime minister, Antonis Samaras when he was the foreign affairs minister in 1991, had raised the issue of 476 million marks with the Germans, their demands were summarily dismissed. If this money had, in fact, been paid as the Germans are legally obliged to do, with interest for more than half a century, Greece would no longer be a problem economy. It is galling too because while ancient historical myths as Greece being the ‘birthplace of democracy’ are routinely trotted out in discussions of the contemporary situation, recent history that people over 70 remember are carefully hidden from view! Be that as it may. What is crucial is that the crisis demonstrates that capital and finance markets need to be regulated more stringently. It was irresponsible lending that led to high government deficits in Greece and to the housing bubbles in Spain and Ireland, to the subprime crisis in the US, and to the meltdown of the Icelandic economy to mention just the most obvious cases. Financial markets are continuing to demand punitive rates of interest from the weaker economies. The unchecked power of finance must be corralled–or we will enter another great depression just as the obsession with the gold standard led to the depression as Karl Polanyi showed in his Great Transformation. What is required is a new political imagination not the shrill advocacy of measures that have already aggravated the situation! To be in Barcelona on Thursday March 29, 2012 was to be a witness to a massive tidal wave of humanity on the streets, stretching beyond the horizon in every direction from Placa Catalunya, the city’s symbolic center. This was a response to the general strike called by Spain’s two largest trade unions–Union General de Trabajadores (UGT) affiliated to the Socialist Party, and the Comisiones Obreras (CCOO)–in response to the conservative Partido Popular (PP) government’s decision to announce the most austere budget since the transition to democracy 37 years ago. As evident on the streets of Barcelona, it was much more than a workers’ protest: though some 30 percent of employed workers had said that they would participate in polls before the strike, Spain has a high rate of unemployment–23 percent or double the European rate and almost half the people under 30 are out of work. The unemployed are the backbone of the indignados (“the outraged”) movement that in May last year that with their tents in city centers and their emphasis on transparency, diversity, egalitarianism, and direct democracy, inspired the Occupy movements across the world. The employment situation is only likely to worsen as Mariano Rajoy, the new PP prime minister who took office in December last year, enacted an Emergency decree two months ago that sharply curbed labor rights. Permanent workers in Spain were eligible for 45 days’ pay for each year of employment if they were fired; this was substantially reduced to a maximum of 33 days and in Andalucia alone eight times as many workers were let go in the two months after the decree was promulgated than in the corresponding period last year. Companies were also permitted to reduce working hours. The greater flexibility to hire and fire workers provided by the new labor laws may provide greater incomes in the short run to employers but will further depress prospects of economic growth in Spain. Spanish wages are already the lowest among the EU 15 (members of the European Union on 1 May 2004 before the inclusion of states from the former Eastern Europe) and the new law would further depress wages in the context of the high rates of unemployment and provide for more short-term employment–which will lead to a reduction in effective demand. Moreover, Spain’s economic problems do not stem from high government deficits but from the burst of a property bubble and absurd laws governing liability of borrowers. The Spanish government had run a balanced budget from the time it joined the Euro in 1999 to 2007–that is to say it did not borrow at all during this period unlike many other economies, including Germany, even though interest rates on Eurozone countries fell sharply. However, though Madrid resisted borrowing at lower rates, Spanish citizens could not resist the lure of cheap interest rates and it fueled a housing boom–housing prices rose by 44 percent between 2004 and 2008. Houses in Spain couldn’t be built fast enough. Great swathes of the coast and the countryside became clustered with urbanisations, instant housing estates thrown up to cater to what seemed to be an endless stream of Britons, Germans, and other norther Europeans now able to live the kind of life abroad of which their parents could only have dreamed. Once the bubble burst with the financial crisis, however, the economy unraveled rapidly–the number of empty and unsold properties in the country is estimated to be between 700,000 and 1,500,000–and some 40 evictions are taking place across the country per day. Employment in construction collapsed and laid-off construction workers account for fully a third of the unemployed. What is more, Spanish law does not allow homeowners to simply hand over the keys and walk away from a property if they can no longer pay the mortgage. They remain liable for the remainder of the mortgage if the sale of the property does not cover the full extent of the mortgage–and they seldom do in a period when property prices have fallen by more than 19 percent. Hence, unlike most other countries, the unemployed in Spain not only lose their houses but remain responsible for part of their mortgages. This has meant that young people who had moved out of their parental home have often had to move back–and even that grandparents have had to use their pensions to help support their children and grandchildren. In turn, the iaiaflautas or retirees and grandparents have mobilized themselves to occupy buses to protest against price hikes, bank lobbies to oppose bailouts, and health departments to turn back cutbacks. it was this that was responsible for the massive turnout–what the strike symbolizes is a new politics, a politics beyond those of political parties because the parties are fully integrated into the system itself that must be changed. So no mere percentages of electricity consumption, businesses that stayed open, or workers participating in the strike can adequately assess its impact. In the midst of the NATO campaign against Libya and the budget deal between Republicans and the Democrats in the US, a far more historically significant event appears to have fallen off the radar. On April 9, 2011, the people of Iceland voted for the second time to reject a government proposal for Iceland taxpayers to repay some €4 billion to the governments of Britain and the Netherlands which had compensated their domestic depositors in the collapsed online bank, Icesave. Initially, the British and Dutch governments had pressured the Iceland government to agree to repay them over fifteen years at a 5.5 percent annual interest–which was estimated to cost each household in the tiny island nation about €45,000 over the period. This was rejected by 91 percent of the voters in a referendum in March 2010. After subsequent negotiations, London and Amesterdam agreed to lower the interest to 3.2 percent and stretch the repayment period to 30 years between 2016 and 2046. The deal was accepted by a large majority of 44 in favor and 16 opposed in the Althingi, Iceland’s parliament, which also rejected a clause to submit the bill to another referendum. Nevertheless, as the President, Olafur Ragnar Grimsson, refused to sign the bill, it was automatically subject to a referendum wherein it was rejected by almost 60 percent of the voters. The Dutch and British governments–which had used anti-terrorist legislation to seize assets of the failed Icelandic banks–have threatened to scupper Iceland’s application to join the European Union and to take the island nation to court. Reykjavik has insisted that the two governments would get most of their money back and the assets of the Landsbanki bank which set up the Icesave operation would be sold and was expected to realize 90 percent of the Icesave debt. What was at issue in the referendum was not whether London and Amsterdam would be compensated or not–but whether private citizens should be expected to shoulder the burden of repayment of a bank’s debt in which they had no hand in incurring and from which they did not benefit. The threat to take Iceland to court is important because it is to frighten off other states which also face indebtedness due to the financial crisis like Greece, Ireland, and Portugal. It is simply the question of whether the bankers have to bear the burden of the bad loans they have extended. With the government relaxing mortgage rules to permit loans up to 90 percent of value, the banks rode the wave–by buying shares in each other they inflated share prices and enticed depositors to shift their savings to shares. In less than 10 years after the privatization of banks, Iceland had the fifth highest GDP in the world, 60 percent higher than that of the United States, and the assets of their banks was valued at 800 percent of Iceland’s GDP. As land prices soared, Icelanders loaded up on lower-interest yen- or Swiss-franc debt. By 2006, Iceland’s current account deficit had soared to 20 percent of its GDP. Late in that year, Landsbanki established an online bank, Icesave, to attract deposits from overseas clients and by offering highly attractive interest rates, it raked in millions of pounds from England, and later millions of euros especially from the Netherlands. This was soon copied by the two other banks. These were established as ‘branches’ rather than as ‘subsidiaries‘ which meant that they were to be supervised by the icelandic Central Bank rather than regulators in Britain or the Netherlands. Because of Iceland’s obligations as a member of the European Economic Area to insure bank deposits, no one thought to worry about whether the Icelandic Central Bank had the capacity to oversee the vastly extended operations of the island’s three major banks. This happy bubble burst in September 2008 when Lehman Brothers collapsed, within a fortnight of which the three big Icelandic banks collapsed and by November of that year the krona had fallen from its pre-crisis level of 70 to the euro to 190 to the euro, so sharply cutting the islanders’ purchasing power that the three McDonald’s franchises were forced to close as the cost of importing ingredients made the price of burgers prohibitive! The country’s stock market lost 98 percent of its value! If ever there was a definition of crisis, this was it. It was the first time in over 30 years that a ‘developed’ state had to seek assistance from the International Monetary Fund. In the light of all this, Iceland’s voters have had the courage to face up to the crisis. It was the first country to kick out the government which had failed so spectacularly. Unlike its neighbor in the North Atlantic–Ireland which underwrote its own banking collapse and loader every household with €80,000 in debt–Iceland let the three banks go under and they imposed capital controls to prevent the flight of capital. Though unemployment in Iceland today is 7.5 percent in Iceland–up from 2 percent in 2002–but just over half of Ireland’s 13.6 percent. Though the krona lost almost half its value, inflation is down sharply and without having to pay back foreign creditors, its government finances are in much better shape than those of Greece, Ireland, or Portugal.